LIFE AS IT HAPPENS...: A TORNADO STRIKES...NAMED NAMI! You may be asking yourself, “How did these parents let this happen? Do they not pay attention to their kids?” Please let me explain. As I have mentioned before, Nami has a lot of trouble sleeping. It’s something we’ve dealt with all his life. He is currently on 4 anti-epileptic meds, all of which have the side-effect of making him sleepy. I’m here to tell you that is NOT a side effect for Nami. I can’t imagine what he’d be like off these meds!! Well, this morning was no different than many others in our house: after refusing to fall asleep until 11 pm last night, Nami woke the whole house up at 4 am while loudly kicking his feet against the door. Salesi went in to tell him he needed to go back to bed and he darted right out the door, cackling on his way. The truck was crawling right down the vent, not to be reached. Luckily our basement is not finished yet, so I had Salesi go into Nami’s room while I went downstairs and worked the truck back up the pipe to the vent so he could grab it. SUCCESS! I said, “No more of that toy for Nami this morning. He will just have to wait out the morning in his room with one of his lids (another one of his obsessions).” The whole family fell back asleep…well, except for Nami. We were so exhausted from nights and nights of lack of sleep that we slept through the tornado happening in Nami’s room. I also slept through the 3 alarm clocks I had set for myself, only to jerk myself awake one minute before Nami’s therapist was to arrive. I ran to get Nami ready only to find his session would be delayed a bit. His therapist, who we LOVE, kindly came in and helped me clean up the mess. This is a plastic mattress cover that Nami ripped apart. We have all had runny noses so our toilet was full of toilet paper. Nami had managed to create another great mess for us to clean up. 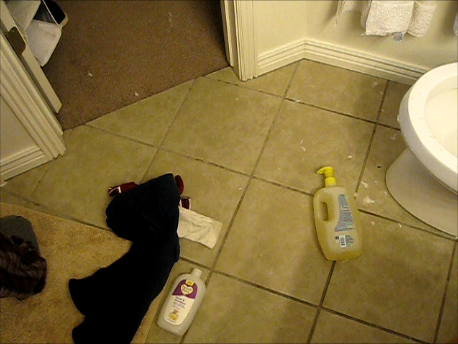 There was toilet water all over the floor and wet toilet paper all down the sides of the toilet, across the floor, on the side of the tub, counter and walls. We popped Nami into the shower and disinfected the entire bathroom. Update at the end of the day: Um, the day for us did not slow down. While I was making dinner, getting meds ready and trying to keep Kope off the counter, Nami sneaked back into our bathroom and threw Christmas ornaments and lids down the toilet. I thought I got them all out, but no sir, they were jammed. After multiple failed attempts at using a plunger to unclog the toilet, I finally had to reach up the toilet and pull out the jammed lid and ornament. I never thought it would be so hard to remember to close my bathroom door, especially with such motivation. Unfortunately I forgot twice in one day! Hey Annaka. I feel for ya. I will complain less about being tired from now on. Stay strong. Nami needs to come have a sleepover so you all can get some rest!